PTT Utility Company Limited CUP2 (PTTUT CUP2) operates a combined cycle power plant in Rayong, Thailand that sells electricity (34 MW) and steam to a nearby aromatics plant belonging to PTT Global Chemical (PTT-GC). It also sells 45 MW to the national power utility, Electricity Generating Authority of Thailand (EGAT). The PTTUT CUP2 power plant has two 40 MW GE gas turbine generators (GTG), two 70 t/h NEM heat recovery steam generators (HRSG), and one 38 MW Shin Nippon steam turbine generator (STG), and relies on natural gas from a PTT gas separation plant. PTTUT CUP2 has already installed Yokogawa system since construction phase, Yokogawa Thailand successfully installed a CENTUM CS 3000 production control system. The plant has been operating smoothly since the completion of this upgrade in 2008. The top priority at this power plant is the reliable supply of electricity and steam, which requires a stable heat rate of no more than 12,000 BTU/kW. The CENTUM CS 3000 system is mainly used for monitoring and controlling the balance of plant facilities, but also serves as the main interface for monitoring systems throughout the plant such as the GE gas turbine control system, the Shin Nippon steam turbine control system, and the PLCs that control operations at water treatment plants. These are all integrated with the CS 3000 system via a Modbus interface. A single operator on each shift can monitor the entire plant from the CS 3000 graphic user interface and, with a single mouse click from the unit master control window, issue a command to automatically start up or stop a gas turbine. The plant operates in either parallel or island mode, and island mode is divided further into MW control mode (DROOP) and frequency control mode (ISOCHRONUS). If the power grid goes down, the STG is automatically shut down and the plant goes offline. This is island mode. When the PTTUT CUP2 is sending electricity to both PTT-GC aromatic plant and EGAT, it is in parallel mode. For each of these modes, the correct procedures for operators are all configured in the CS 3000 system, ensuring both ease of use and safety. Efficiency is also important. Key to this is the visualization of what is happening throughout the plant so operators can take quick and correct action to keep each process operating at maximum efficiency. A single graphic display shows the heat balance data and performance figures for the GT, HRSG, ST, auxiliary boiler, condenser, cooling tower, and the steam cycle. 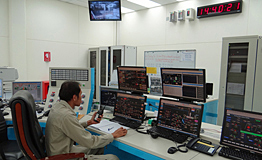 Operating one level up from the production control system, a plant information (PI) system brings together data from throughout the plant so that operators in the central control room can stay constantly apprised of what is happening throughout the plant and initiate actions in real time that will enable the maximum utilization of plant assets. Somsak Vilariratanasuvan, the plant manager, went on record as saying: "Our production is always based on a yearly schedule and we are always striving to achieve production targets. We are very happy with this plant's Yokogawa CENTUM CS 3000 system and its ease of use. The plant runs year round and provides a steady supply of electricity to both the PTT-GC aromatic plant and the national grid. 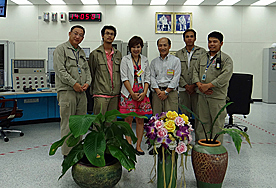 We appreciate the high reliability of the CS 3000 system and the support of Yokogawa Thailand."